We recently attended a workshop and talk Sonia hosted at the Soho House and became obsessed with her tips and recommendations for using all green beauty. We are creatures of habit and have such a hard time changing anything that when Sonia discussed her beauty routine and how we too could incorporate some better beauty products into our life, we listened intently. 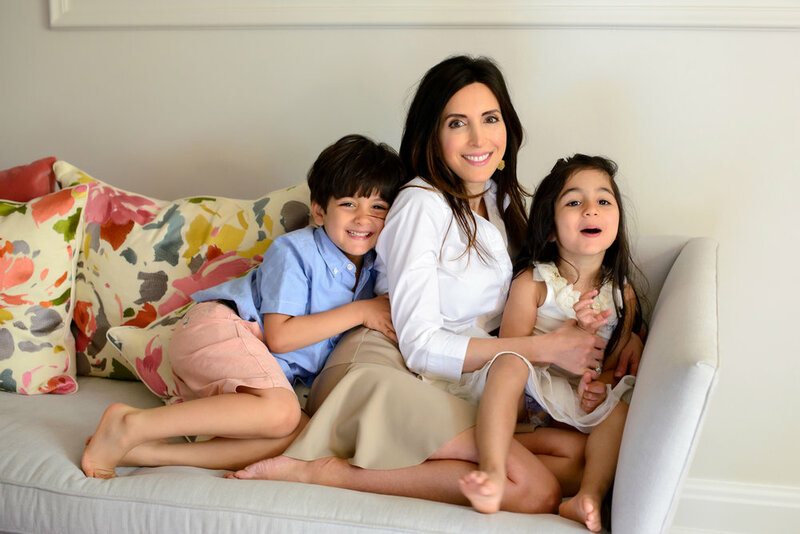 Her story of how she transitioned to a green beauty and wellness influencer while balancing her family life, has inspired us to pick better products for not only ourselves but also for our family. We are obsessed with her GIFT picks and hope you enjoy them too! I'm a corporate lawyer and practiced for almost 9 years. My career was exciting and challenging, but I knew I would ultimately transition to an entrepreneurial venture in the beauty industry. When my first child was born, I knew instinctively that I wanted to be with him full-time, and resigned from corporate life. I also knew it was time to pivot towards my life-long passion of beauty and skincare. I naturally scrutinized the label of every product I was using on my son. As I educated myself about which ingredients were safe for babies, I realized that most of the products I was using on him contained concerning ingredients. Which led me to think whether they were even safe for adults to use. This question was the beginning of my ongoing research and study of the ingredients in personal care products and the laws and regulations that govern them. All of this leads to who I am today: an attorney turned green beauty + wellness influencer. I'm the founder of KEU (soniakeu.com), a green beauty and wellness blog where we present the latest in non-toxic makeup, skincare and wellness. The content is thoroughly researched, unbiased and scientifically sound. KEU partners with a curated selection of affiliates who share our standards for ingredient consciousness, transparency and high-performance. Contributing writer for green beauty and wellness brands such as Hynt Beauty, Ora Organic, and The Detox Market. Content creator for the YouCam family of apps, including a weekly live show on the YouCam Makeup App. I use this moisturizer myself. It was formulated by a woman who is a chemistry genius and used to work for Estee Lauder. It’s a complete multi-vitamin, antioxidant and mineral supplement for the skin, so ideal for the busy woman who doesn't have time for a complicated beauty regime. Which likely describes most of our mothers! Everything is paraben and sulfate free, and not tested on animals. And the best part is it makes your skin look and feel ah-mazing. Mom deserves the best-of-the-best in green beauty, and Hynt makes three of ‘em: DUET Perfecting Concealer, FORTE High Definition Eye Liner, and NOCTURNE Mascara. Winner of multiple beauty awards, DUET is a staple in the makeup kit of every ingredient conscious makeup artist. It’s a light and never cakey formula that melts into the skin for comfortable, all day wear. The name says it all. These chocolates are vegan, non-GMO, ethically sourced and packed with superfoods. There are six flavors to choose from: Beauty, Energy, Femininity, Focus, Love and Tranquility. They’re never heated above 118° to protect the integrity of the nutrients, and sweetened with birch xylitol and non-bitter organic stevia extract. So they’re sugar-free without resorting to artificial sweeteners. Mom loves chocolate as much as every woman does, and these are both guilt-free and good for her. Moms typically don’t take enough time for themselves, but Sangre De Fruta’s fresh, artisanal skincare will inspire Mom to do just that. Their signature product is the Botanical Body Cream, which has the most luxuriously seductive whipped-butter consistency. I would gift Mom with either the Trio Gift Set or one of the multi-product Gift Box Collections, so that she can sample the various scents and decide which one is her favorite (making next year’s Mother’s Day gift a cinch!). The line is made entirely by hand in Vancouver, British Columbia, using locally sourced, organic and wild-crafted plant-based ingredients. Perfume may seem like a cliche gift, but Pour Le Monde® Perfumes are not your average fragrances. It’s the only certified 100% natural, fine fragrance company on the market. The perfumes are formulated with natural essential oils and infused with a grain alcohol, rather than the usual synthetic ingredients, so they’re non-toxic. There are three scents: Envision, Together and Empower (which is unisex), each one sensual and classic. And each scent benefits a different charity: Guiding Eyes for the Blind, Cancer Support Community and National MS Society. Who wouldn't love a brand new set of makeup brushes? Especially ones that are as well designed as Alima Pure’s - one of my fave green beauty brands. They’re made with super soft, 100% cruelty-free Taklon synthetic bristles, which have genius white tips to help you see just how much product is on them. Sturdy sleek black handles give you a comfortable and stabilizing grip. The Curated Classics include the essential brushes every woman needs: Foundation Brush, Blush Brush, Concealer Brush, Allover Shadow Brush, and the Precision Angle Brush. Did Mom used to complain that your teenage antics were aging her? Gift her this Retinol Night Serum by natural skincare guru Marie Veronique to make up for it. It smoothes fine lines and wrinkles better than any other product I've tried (plus, it clears pores and controls breakouts). It’s well-established that retinol (a derivative of Vitamin A) is the only topical product capable of reversing skin aging and sun spots. Marie Veronique’s Retinol Serum combines micro-encapsulated retinol with Vitamin C, plus Vitamin E for its stabilizing ability, to boosts collagen production and speed cell turnover. It delivers the same results as prescription retinol products but without the irritation. The best gift is one she would never buy for herself, and most moms would not buy a $56 lipstick. But if you get it for her she’ll be pretty thrilled. Winner of the 2017 Glamour Beauty Awards, Kjaer Weis’ lipsticks are about as luxurious as it gets. It’s a curated selection of the six colors that Kjaer Weis’ founder, Kirsten Kjaer Weis, thinks every woman needs and can wear. Packed with shea butter, rosehip and jojoba oils, these nourishing formulations keep lips plump and smooth all day. All Kjaer Weis products are refillable, so once you get to the end of the gorgeous, Marc Atlan-designed silver tubes, you just buy the $36 refill. These are for the Mom who thinks about everyone else’s health and tends to forget her own. Ora’s Omega-3 sprays, Probiotics and Superfood Protein Powders are made with the purest organic, plant-based ingredients. The products were formulated by a trained chef with a mission to replace synthetic supplements with nutrients from real organic food. Bonus: each product tastes so good that Mom will never “forget” to take it.